Hi, I’m Lewis. Welcome to foot4ward. This blog is a combination of race reports, training logs and my personal thoughts on my running experiences. I reduscovered running in February 2009, aiming to get fitter and run a 10k, and from there ran the Paris Marathon in under three hours and raised more than £1900 for The Stroke Association. In April 2011 I’ll be running the Virgin London Marathon – my second ever marathon. This blog isn’t all about the big races. I like to support the grass roots racing community, so you’ll see reviews and previews for the international ‘event’ races alongside equal levels of coverage for local club races. 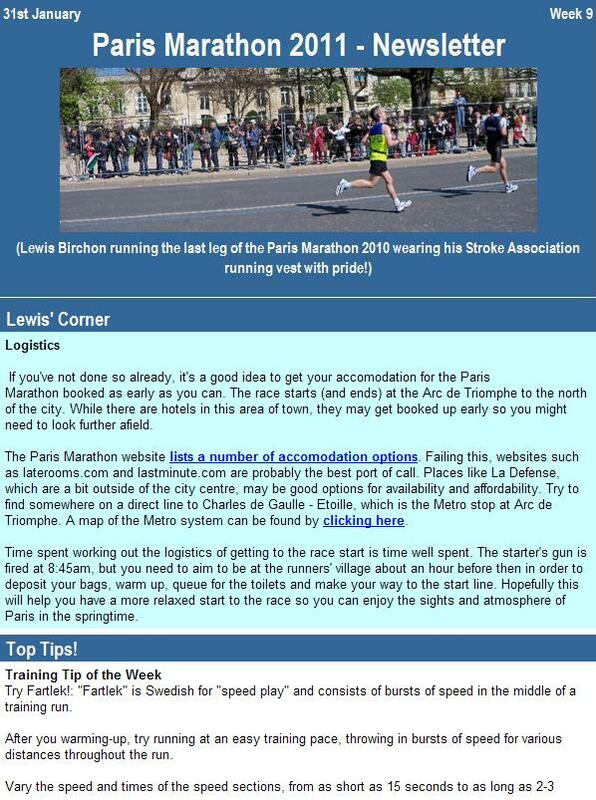 Similarly, you’ll find me popping up in places like The Stroke Association newsletter for The Stroke Association’s bond runners. If you have a race to promote, charity bond places to fill or need some running-related writing, get in touch. I can be reached at lewis.birchon@hotmail.co.uk. Unfortunately I’m not going to be able to make it this year, although I think I’ll be back in Oxford for the Town & Gown the following weekend. I hope the race goes well again this year – it’s a great event and a lovely place to run. Oh dear… If the year I ran it was anything to go by, I really don’t think they have enough marshals or signs to manage a full 13.1 mile loop. It would be better organised as a two-lap course, which would hopefully prevent things like this happening.